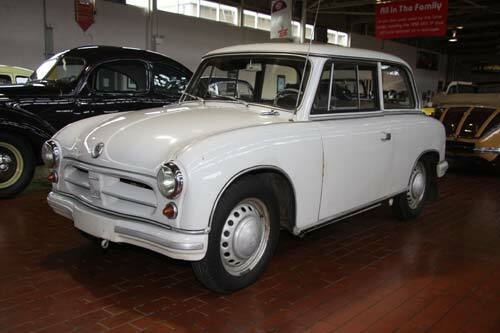 The Trabant P 70 was the first people's car made in East Germany after WWII. The body of the P 70 is made of Duraplast, which is a mixture of fabric and resin that is pressed into a mold. This method of manufacturing was much more economical than making the bodies out of fiberglass. The P 70 was quite unique in the fact that it has front wheel drive and independent front suspension. The P 70 led to the development of the P 50 and P 60 which were slightly smaller cars with smaller engines. 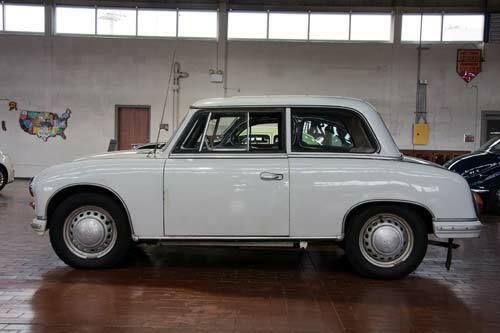 The final variant was the Trabant 601, which remained in production until 1991, and sold more than 3 million units. 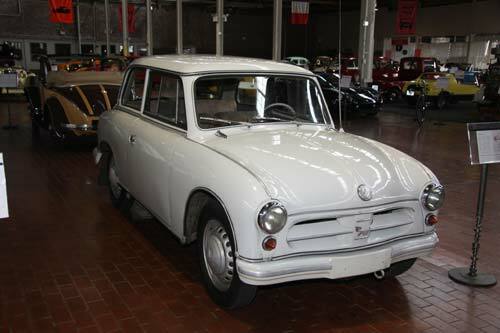 This P 70 is special because it was bought new in 1958 by a gentleman from Poland. He owned the car his whole life, and died in the mid 1990s. His family continued to keep the car in a heated garage until 2011 when they sold it to the museum. It has covered over 87,000 km, and sits here as a piece of history.